As a most fitting preamble to the following presentation on The Asylum City, let us all have in our hearts a prayer to the Holy Ghost, Our Blessed Mother, Saint Joseph, and the Seven Great Archangels who stand before the throne of God in Heaven, for enlightenment on a somewhat deep mystery for Our Times, the End Times. And if you find it difficult to label the interlocutor, simply call him a WITNESS! "And what kind of witness?" you might ask. "A witness as a seer, locutionist, mystic, prophet, dreamer, or as a bit of all that together?" It would be perhaps quite presumptuous to answer, "Yes." However, there are elements of all that in the Witness, in such a hodgepodge way that he can better fade into the background. God works in mysterious ways, not wanting to divulge prematurely what He wants to be divulged in his own good time only. This being said, I cannot, nor shall ever be able to deny that God in his Mercy, deigned to look "under the barrel", so to speak, to find me, and see what He could do with me ... no sooner had I made my Consecration to Our Blessed Mother in the early '70's. He had certainly seen me before, but my erratic pattern of life, to say the least, made Him delay maybe. When He picked me up, one day, I cowered a bit and was quite puzzled as to why He was determined to make use of me, and show me things, without ever letting me know what He was out to make of me. Of course, in earlier years, I had inklings of the supernatural, but I thought that everyone had these experiences, until I found out otherwise, and started to keep my mouth shut and went about my life - in a checkerboard fashion as you will see. I had many careers! After college, with the Eudist Fathers, I became a journalist, an office clerk, a bit-player in the theater and television, a seminarist, a radio announcer, a translator, a copywriter, and, lastly, a teacher, each time changing place to cover a great part of Canada and the U.S.A. But, it is only after my formal consecration to Our Lady, in 1976, according to the formula used by St. Louis Marie Grignon de Montfort, that I started to realize more fully I had embarked on "some journey." A journey of no return! I was promptly reminded by God the Father, in broad daylight, on a day of discouragement. I had decided to fight for God, and there, at the first scratch, I felt like running! But Our Dear Heavenly Father intervened saying very clearly, that I would lack charity towards Him and the Church! Now, these were words to ponder about! And I did for days. I just could not put it in my head that one could lack charity towards God. But then it slowly sank in my heart that God wanted our love. The very reason He had created us!, and I perhaps would deny Him that love. Now I say, like Marie-Julie Jahenny of France, a stigmatic who died in 1941, "Lord, I want to love You unto blessed folly!" What kind of journey had I embarked on? I still do not fully comprehend, a journey that started in 1989, as you will see, and I am plodding along with much trust in my heart and I am in God and Our Lady's hands. And that suffices me! I shall now proceed to try to piece together what I still think is a giant puzzle, The Asylum City! 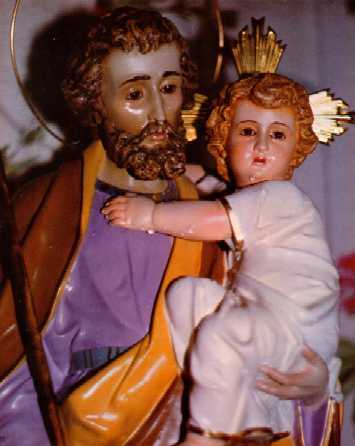 Things took off in 1989, when, on January 21, St. Joseph appeared in the sun to show me the habit of a future community, and when, three years later, Our Lady first came to the Birch Tree, in The Asylum City, as Our Lady of Lourdes, on August 27, 1992: She will last come as Our Lady of Revelation, on September 29, 1997. During the 5 years of visitation, She came under numerous titles, as foreshown in a dream-vision, on September 13, 1990. She will visit at the Birch Tree on every major feast days during that period. St. Thérèse of Lisieux also came, as did St. Peter. She always showed Herself in an interior vision when we intoned the Salve Regina, but She never spoke, leaving me only with a comprehension of the vision. A last thought, of great importance, I believe, for those who are asking where to go in these Latter Days ... listen well to the response that Christ gave to the Shepherdess of La Salette, to whom the Abbé Combe had asked what place in France would not have to suffer in the general upheaval prepared by God, "What is pressing is not to scrutinize the future, but to bring the world back to God." And Our Lord added, "EVERYWHERE SHALL I MANAGE TO SHIELD MY OWN FROM THE UPHEAVAL." will perish in the fire of February 6, 1988 (cf. narration in Section VIII).